As of June 27, 2012, some additional drainage work is being done to correct some issues that were unforeseen in the original design. This work is expected to be complete July 13th. The final electrical connections to the signal cabinet bases are being made to activate the new signals. Work is continuing on the landscaping around the storm water management ponds. Work is ongoing throughout the project limits to clean up debris, remove the silt fence and topsoil and seed adjacent to the curb and sidewalk. DelDOT thanks everyone for their patience during this construction project. Despite baking heat we continue to expose and document archaeological features at the Elkins A site. The material filling up the cellar hole is now largely removed. There was a mass of bricks in the southern half of the hole, probably collapse from a chimney. One nice find from here is an iron pintle: part of the hinge for a door. We think that the cellar hole was filled in all at one time, presumably when the house was abandoned sometime around 1780. So far we have seen no sign of the house that stood over the cellar. This is disappointing but not surprising. Houses in 18th century Delaware were often log buildings that had little impact on the ground surface, and they were often dismantled and moved to new locations. This may be the case here, but it is hard to be sure yet because we also know that quite a lot of soil (perhaps as much as 1.5 to 2 feet) has eroded away from here since the 18th century, taking some archaeological evidence with it. We will be testing out different ideas as the dig goes on. Around the cellar hole areas and patches of dark soil containing animal bone fragments, and broken pottery and glass are showing up as we clean down the surfaces exposed by the machine. These soil patches are lying in shallow depressions and are interpreted as “middens” or trash deposits that accumulated as the occupants of the site disposed of their trash and garbage around the yard. Archaeologists love other people’s trash: it provides us with a whole range of information about past ways of life that might surprise the people who created it. One of the techniques we will be employing on these trashy soils is flotation: we basically pass soil samples through water to separate small fragments of light organic materials like seeds, plant fragments and even insect parts, from the heavier materials that may also include evidence of past human activity. Examples are fruit pits, small pieces of bone and shell, and fragments of artifacts like ceramics, glass and metal. 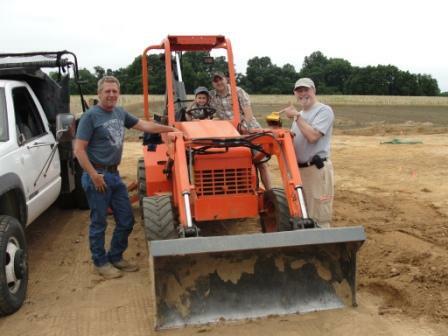 The Clarke boys, Dr. Burrow, and the operator try out some new equipment at the site! Mother nature relented this week and gave us some much-needed rain. This has softened the soil and made much clearer the color and texture changes that are so critical to dissecting and understanding the site. We have placed sheets of black plastic over the machine-cleared areas to retain the moisture as much as possible. Progress on the machine clearance has been much better as a result of the rain; the field team have been shoveling and trowelling the cleared areas on the Elkins A site. As a result we have found several cultural features that are visible as soil stains. We have not dug into these yet: the job at this point is to identify all the features and only then make decisions about which to excavate fully or sample. The rain was also an opportunity to send some of the team back to our field lab and process some of the artifacts: too many people on a wet site can damage the archaeology. The machine was not used on the area around the house basement that had been identified in the previous phases of work. Clearance of the plowzone here was done by hand. The result can be seen on the photograph, which shows the exposed filled-up basement of the mid-18th century house. The view is facing to the south. The dark soil filling the rectangular basement is surrounded by the cellar walls which are made of large cobbles, probably brought from the bed of nearby Scott Run. Some of the stones have been dislodged by modern plowing, but the structure is remarkably intact. The trench running across the view is the excavation we did in the Phase II study. We have removed the backfilled soil from this to re-expose the profile across the cellar. In the middle of this trench you can see a circular feature (just left of the blue plastic flagging): this is the Phase I shovel test dug by our colleagues at Archaeological and Historical Consultants which was one of the vital first clues that there was an important site here. The cellar is about 7.5 feet east-west by roughly 15 feet north-south. One of the things we will be trying to establish is whether this feature reflects the size and shape of the house above it, or whether the house was larger and the cellar was only under a part. We have so few examples of other houses of this period from Delaware that either is possible, even though a 7.5 by 15-foot house seems rather small by modern standards! As of June 20, 2012, work on the south side related to sidewalks, entrances and handicap ramps is ongoing and is complete. We had a few small sections heave due to the excessive heat that need to be replaced. The replacement will occur the week of June 25. Work is being performed on some additional drainage work to correct some issues that were unforeseen in the original design. This work is expected to be complete June 29th. Work is being performed to install the signal detection loops and pedestrian signal poles at each of the signalized intersections. This work is expected to be complete by Friday June 22. Upon completion the final electrical connections to the signal cabinet bases will be made to activate the new signals. DelDOT apologizes for the inconvenience of night work during the removal of the old Indian River Inlet Bridge. Removal of the bridge over the water is safer being performed at night, thus we believe we need to perform that work at this time. Fortunately there are only four other dates when night work will be required. They are tonight June 19, and then again on June 24, 25, 26 and possibly June 27. Future bridge demo work may involve noise, but it will be completed during daytime hours. Again, we apologize for the inconvenience, but are eager to get this work completed. The bridge demolition operation is scheduled to be completed in September 2012. The Elkins Archaeology site has begun excavations, and after the first week of work there are some amazing finds. The first week of excavation has produced a good range of 18th century artifacts similar in type and distribution to those recovered during the earlier Phase II work. One spectacular artifact was found. 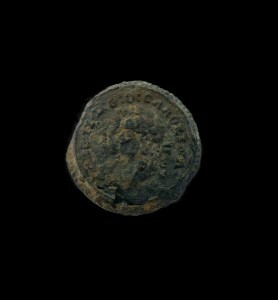 This is a copper alloy disk which was attached on the back to a chain and was part of a “sleeve-link” (like a cufflink). The front of the disk has profile portraits of King George the Second of Great Britain and his wife Queen Caroline. We know this from the Latin inscription around the edge. George II reigned from 1727 to 1760 (he was George III’s father). He and Caroline of Ansbachwere married in 1705 , and she died in 1737. So this object must date to between 1727 and 1737. What makes it “spectacular?” Well firstly, it seems to be a rather rare kind of object: our research to date has not found many other examples. Our working hypothesis is that this is a commemorative item produced for the 1727 Coronation. Secondly: it looks like a prestige object. So what is it doing out here in central Delaware? In fact, it fits in quite well with what we have been seeing at this and several of the earlier 18th century sites within the 301 corridor. The high quality of many of the artifacts from these sites shows that the people living here, far from being self-sufficient isolated pioneers on the frontier, were well connected to the colonial and international trade networks of 18th century America, and were profiting from them. The shortage of rain that Delaware has been experiencing is making our digging task a bit harder right now: the soils below the plowzone get very hard and dry under these conditions, making it more difficult to dig and to see the subtle differences of color and texture that often show us where archaeological features like pits and cellar holes are located. During the next week we will concentrating on the removal of plowzone from Elkins Site A with the machine and shovels, and identifying and mapping features as they are exposed in the underlying soils. As of June 14, 2012, work on the south side related to sidewalks, entrances and handicap ramps is ongoing and is expected to be complete Friday, June 15. Work is being performed to install the signal detection loops and pedestrian signal poles at each of the signalized intersections. This work is expected to be complete by Friday, June 22. Upon completion the final electrical connections to the signal cabinet bases will be made to activate the new signals. Work is continuing on the landscaping around the storm water management ponds. Work is ongoing throughout the project limits to clean up debris, remove the silt fence and topsoil and seed adjacent to the curb and sidewalk. Please note there will be minimal to no impact to the public due to this work. 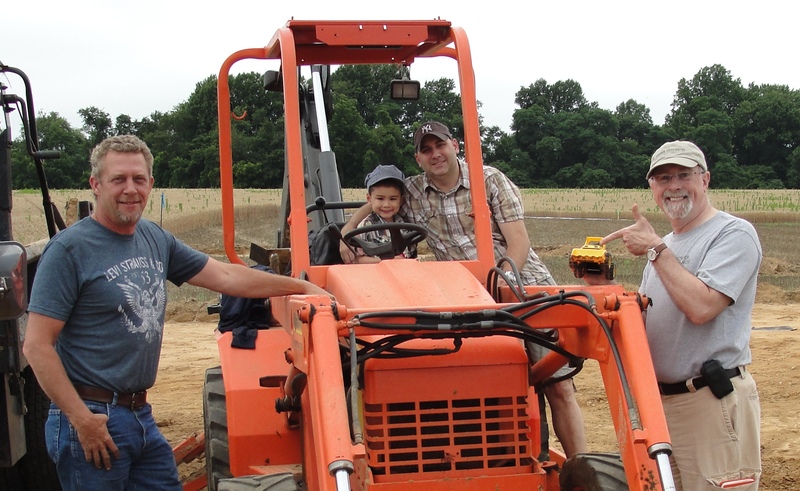 As DelDOT continues to plan ahead for the construction of SR 26 Improvement Project, it wishes to advise motorists and residents that some initial survey work and field review work related to utility relocation will be occurring this summer. There should be little to no traffic impacts for the activities noted below. DelDOT and representatives from the utility companies will be conducting field reviews on SR 26 between St. Georges Church in Clarksville and the Assawoman Canal to identify future utility pole locations and the new state right-of-way. This will require surveyors to place wooden stakes along the new right-of-way to help identify the location of proposed utilities. This will be followed by field reviews conducted by the project team and the utility companies. This utility coordination is essential to minimizing the impacts of utility relocation work during construction, as well as impacts to the surrounding communities and traveling public, as we prepare for construction on SR 26. DelDOT will be working closely with the utility companies to ensure that the location of the proposed utilities meets the needs of the project, all while trying to minimize any impacts to adjoining properties. Once the field review has been completed over the next few months, DelDOT will be removing the wooden stakes. Public cooperation during this process is greatly appreciated. As of June 7, 2012, all work on the north side related to sidewalks, entrances and handicap ramps is complete. Work on the south side related to sidewalks, entrances and handicap ramps is presently being performed and is expected to be complete by next Friday. All final pavement markings are complete. Work is continuing on the landscaping around the storm water management ponds. Work is ongoing throughout the project limits to clean up debris, remove the silt fence and topsoil and seed adjacent to the curb and sidewalk. For more information about the US Route 301 Archaeology program please view this brochure. Over the next year or so, I’ll be providing weekly updates on the progress of the Archaeology program. So let us begin our journey at the Elkins Archaeological Site! 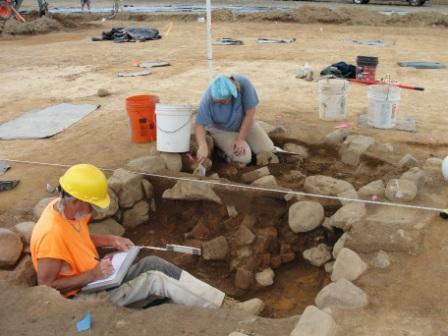 The Elkins Archaeological site dates to the late 17th through the 18thcentury. To learn more about the Elkins site please view this brochure. 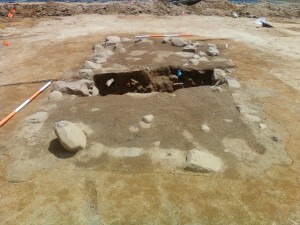 The phase III excavation of this site begins June 4th so stay tuned for more amazing finds as we begin more work at this and other Archaeology sites on the US Route 301 project! Welcome to the DelDOT Blog. We hope you find this blog to be interesting and informative. The goal of this blog is to keep you updated on the various projects we are working on. You can view updates for a particular project by choosing a category from the menu below.